The U.S. farm sector continues to work through the adjustments necessary to restore profitability. These adjustments include the painful process of bringing fixed costs under control. Equipment and land costs are two of the most significant fixed cost items for most farms. As we have discussed before farmland values and rents appear to be in the process of working lower. In this post we take a look at some indicators of farmer’s investment in farm equipment and how that has changed over time. It appears that farm equipment sales continue to be soft indicating that farmers are significantly reducing their new investment in this area. Recent data released by the Association of Equipment Manufacturers showed that year-over-year sales of large farm equipment were down sharply in January. For instance, two wheel drive tractors over 100 horsepower fell by 38% in January of 2016 as compared to January of 2015 and four wheel drive tractors were down by 9%. The lone increase for large equipment was in the area of combine sales which increased by a 21% in the same period. The Kansas City Federal Reserve Bank’s Agricultural Finance Databook contains a great deal of information on the farm sector. The databook reports the annual volume of bank loans made for machinery and other equipment (Figure 1, adjusted for inflation). Real commercial bank loan volume for machinery and equipment grew rapidly from 2002 to 2006 when it reached a peak of $8.3 billion. From there it fell to roughly $4 billion where it remained until spiking upward in 2012. Since then it has continued to decline and in 2015 sits at just over $3 billion. Figure 1. Real (2009 USD) Machinery and Equipment Loan Volume at Commercial Banks, 2000-2015. 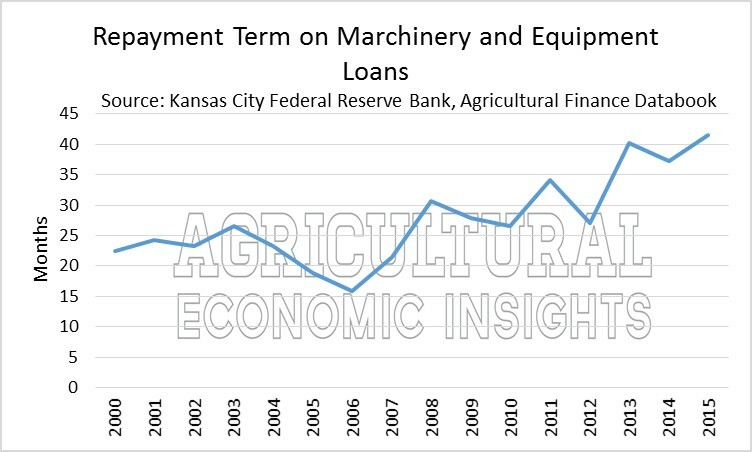 Source: Kansas City Federal Reserve Bank, Agricultural Finance Databook. Even when looking at annual data loan volume for machinery and equipment can be quite volatile. One can see that annual swings in loan volume exceeding 40% are not uncommon. Still, the large decline of 67% from 2012 to 2013 stands out. Likewise, the large increases over 20% in 2003, 2004, and 2012 stand out on the upside. Figure 2. 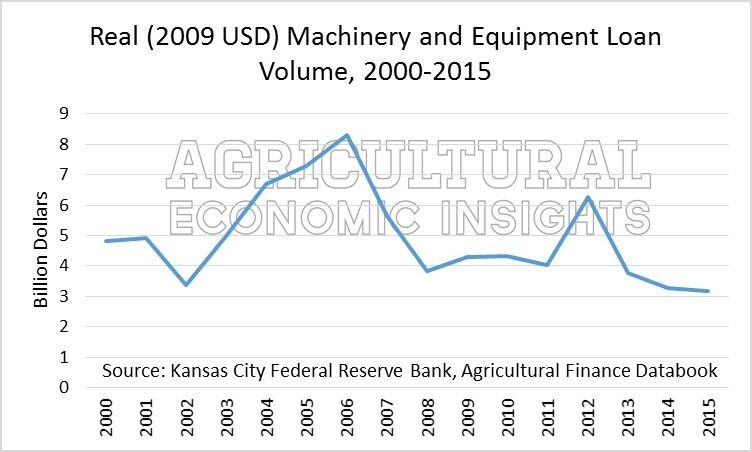 Annual Percentage Change in Real Loan Volume for Agricultural Equipment and Machinery, 2000-2015. Given the magnitude of the economic slowdown in the farm sector one might have expected loan volume for equipment and machinery to fall at a more aggressive pace since 2013. However, it is important to note that these are loan volumes and not sales of agricultural equipment. One might reasonably expect that some of the new loan volume in this area represents refinancing of agricultural equipment purchased with cash in more prosperous times. The data also include the average term in months on these loans (Figure 3). Here, we can see that farmers and lenders have made the choice to significantly extend the length of these loans over the time period shown. Since 2000, the average repayment term has roughly doubled, starting at 22 months in 2000 and ending 2015 at 41.5 months. This is the longest average repayment period in the data set and combined with today’s low interest rates has allowed farmers to significantly reduce the required payments as opposed to shorter term loans. Figure 3. Annual Average Repayment Term in Months on Farm Machinery and Equipment Loans at Commercial Banks, 2000-2015. Bringing fixed costs under control is one of the most difficult, but important, adjustments that farmers will need to make in order to bring costs under control. 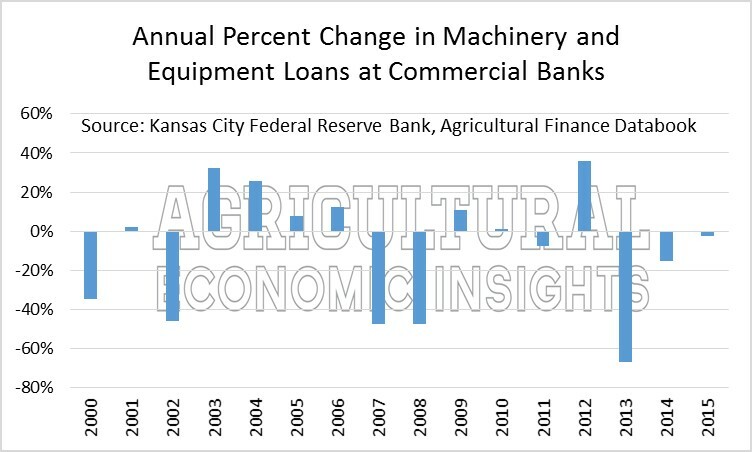 Based on reports of agricultural equipment sales and farm loan volume data it appears that some of this adjustment is underway. Agricultural equipment sales and loan volumes can be very volatile. Recent declines in loan volume have been substantial and have brought levels down significantly. In fact the loan volume data indicate that in real terms loans for farm equipment and machinery have fallen to the lowest levels seen in the last 15 years. Further, the terms on the length of the repayment term on machinery and equipment loans is at its highest levels. Combined with low interest rates this adjustment should help provide farm borrowers with some breathing room on debt repayment capacity. However, one will want to closely watch repayment capacity should incomes fall further or interest rates begin to rise. Given the need to continue to reduce fixed costs and improve cash flow declines in machinery and equipment loan volume were not unexpected. Going forward one must wonder whether the cutbacks in capital spending have been sufficient to get fixed costs moving in the right direction or whether further reductions will be necessary. While loan volumes have declined, judging by Federal Reserve surveys of bankers expectations for farm capital spending and farm income and comments, it appears that they expect farm capital spending may continue to be very soft in the coming months.